The concept for the Jailhouse B&B was born out of conversation with friends. Anna Sue and I loved the downtown area of Excelsior Springs, Mo and wanted to add our two cents worth to it. Our friends helped us re visit that old desire to own a B&B and once the thought was planted in our minds, we took the idea and ran with it. Besides the history behind the property that we chose to make our home, my wife fell in love with it the moment she saw it. I put in a lot of research and elbow grease to purchase the property, as it wasn’t easily obtainable in the beginning. I then spent many months in the gutting and restoration process to get it ready. It has already been quite a rewarding journey. I’ve learned so much from this experience and gotten to use a lot of my renovation skills. 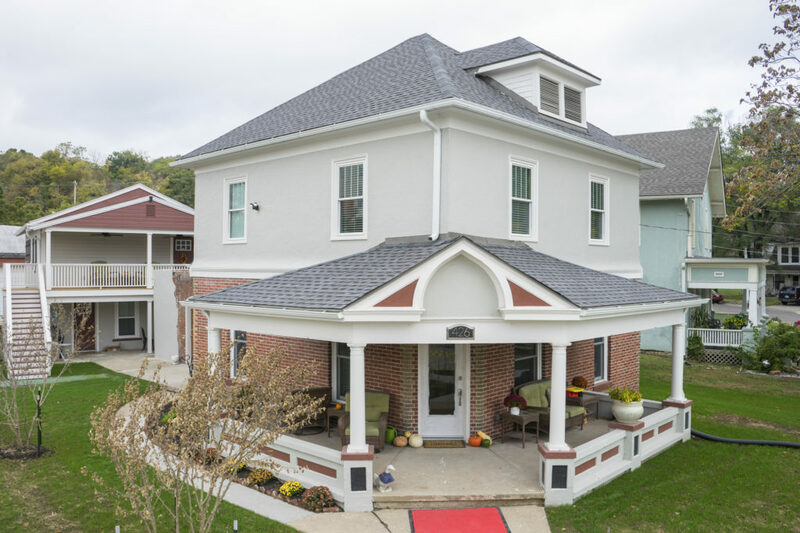 Formerly a jailhouse and home to legendary police Chief Bill Payne, the B&B property holds lots of history and adds value to the historic past of Excelsior Springs. We purchased the property in order to renovate it and restore its beauty. We relive its history all the time through our storytelling. We love to share the details that are found throughout the house through telling the stories that have been passed down in the records. Payne served as Chief of Police from 1926 to 1953. He built onto the back portion of his own home in order to have a place to transport the shackled prisoners, over from the police station, so that he could sleep in his own bed at night. They didn’t have a jailhouse back then, so the logical thing to do was to build one and keep everyone safe while he slept at night. Thus, a home with a jailhouse built onto the back. The actual jailhouse has exposed brick walls. We have kept some of the original features, along with historical mementos that were left in the home. Come visit us sometime. Located 30-45 minutes outside of KC, we are a great place to escape over a weekend from the norms of life and allow you to relax, spend time, or just a nice romantic getaway. The B&B is close to downtown, so it’s a great place to walk around, see all the history of this area, shop in the flea markets and antique shops and stop in a local coffee shop and drink a cup of Joe. Want more stories? We have plenty to share. Come see us!